Guacamelee! is a game developed by Drinkbox Studios. Released in April 2013 for the PS3 and PS Vita, it eventually saw a port on Windows in August later that year. It got very favorable reviews, even a couple of awards. The game was fun, fast paced, controled well, and generally anybody's complaint about the game itself was that it was too short. The game, if you didn't try to 100% it, only took about 3 hours to beat, but considering it's a Metroid-style game where you get upgrades hidden in nooks and crannies, it makes sense, since Metroid games are typically pretty short anyway. I won't be playing that version. Instead, I'll be playing the most recent version of the game, Guacamelee! Super Turbo Championship Edition, released in July 2014 for pretty much any system that didn't have the original Guacamalee!. 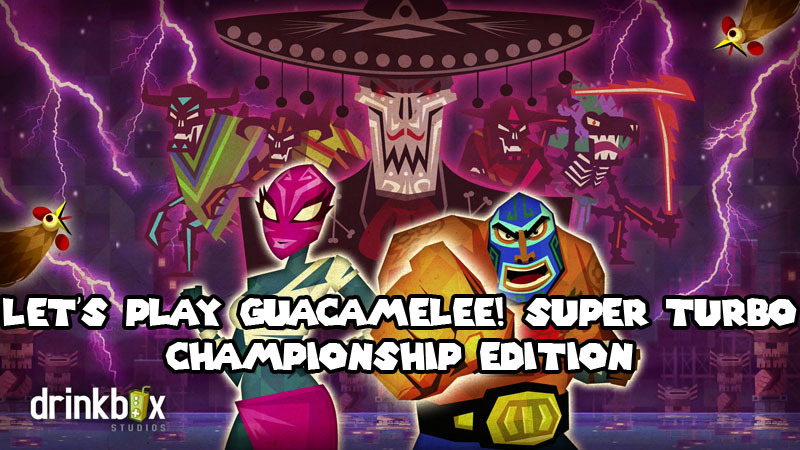 Not only does it have all the DLC that was released for Guacamelee!, but it also includes entirely new areas, enemies, and even an extra boss. It bumps up the game's length from about 3 hours to about 5 hours, so it's still pretty short, but not TOO short. I love this game, but it DOES have some issues, but none of them are really gameplay related. The background in some areas has a lot of memes and referential humor that I don't really like, and the game, despite being a bit longer, is still too short. Still though, it's a very, very good game that I have platinumed twice. Also please post cool Lucho matches, thanks.